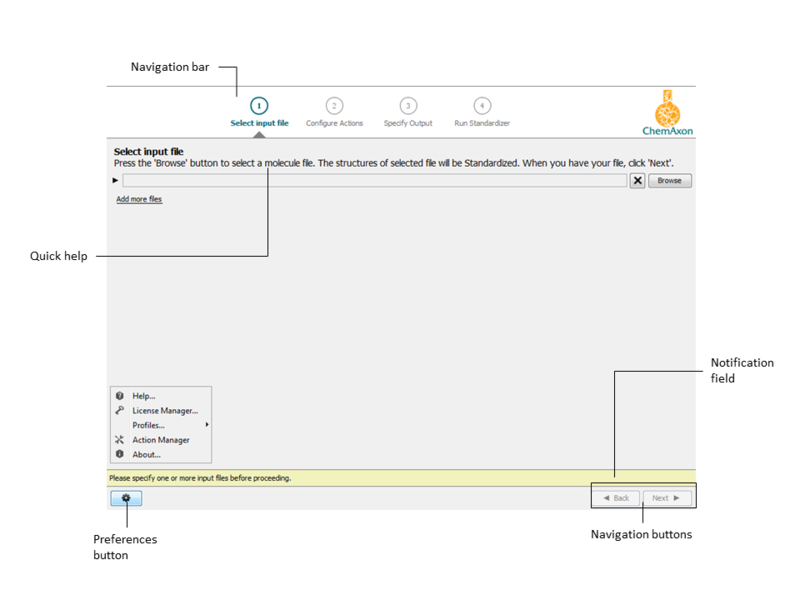 The Standardizer Application is an easy-to-use, high-end graphical user interface (GUI). This GUI allows you to reach all the functionalities of Standardizer without the need of using the command-line with parameters or editing configuration files manually. The Standardizer Application will provide you a friendly way to bring your molecules to a standardized form with guides for each task you may encounter. In this step, you can define the files to be standardized. Click on the Browse button on the right side to add files one by one; click on Add more files to add further files or multiple files at a time. Select one or more files (Shift or Ctrl + mouse click) and click Open. You can add unlimited number of files but remember that the output will be written to only one file. To remove a file from the list, click on button in line with file. Click Next to proceed to the next step. In this screen, you can see two panels. On the left, all available actions are listed in alphabetical order. For creating your actionlist, select the actions you want to perform and click the Add button to transfer it to your configuration, i.e., into the right panel. Learn more about using the Configure Actions window here. You can specify your output file in this step. Click on the Browse button on the right side to set your output file. Note that every molecule of the input files appears in a single output file. Finding errors does not stop the procedure if you select Ignore errors and continue with next molecule. 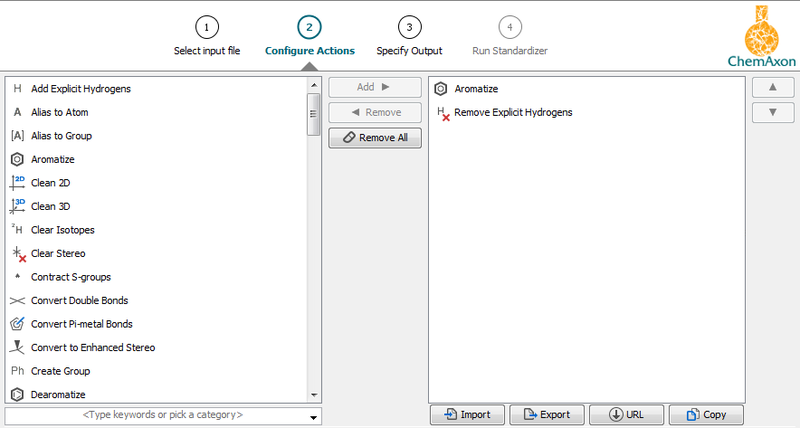 You can start your standardization process after you have specified your input and output files and selected the Standardizer actions you would like to apply on your molecules (created your Standardizer configuration ) as it was described previously. compare input and output molecules. In this page, you can review the specified input and output files and the selected error handling before running Standardizer. If you are satisfied with your settings, press Run to start Standardizer. During the Standardization process, you might see a preview of your structures being processed. the number of input structures along with the number of input files. the status of the standardization procedure. Use the scroll-bar on the right for browsing the structures. You can use the scroll-bar to move the window viewing area. All: Displays all structures that were subjected to standardization. Changed: Displays structures that were modified during standardization. Unchanged: Displays structures that were not modified during standardization.